W 22.5” | D 22.5" | H 33” | ARM H 18.5"
INSIDE W 12.5" | INSIDE D 15" | SEAT H 14.5"
MAJESTY "PINK LADY" WITH SHINY SILVER WELT, JACKIE-O BUTTONS (Discontinued), CUSTOM BROOCH & SILVER LEGS. If you are only as good as the company you keep then why is your house still filled with unnecessary clutter? You should get inspiration from your belongings, not be weighed down by them. Baby Isabella is sure to inspire late night phone calls to old lovers and spontaneous trips to Paris with new ones. 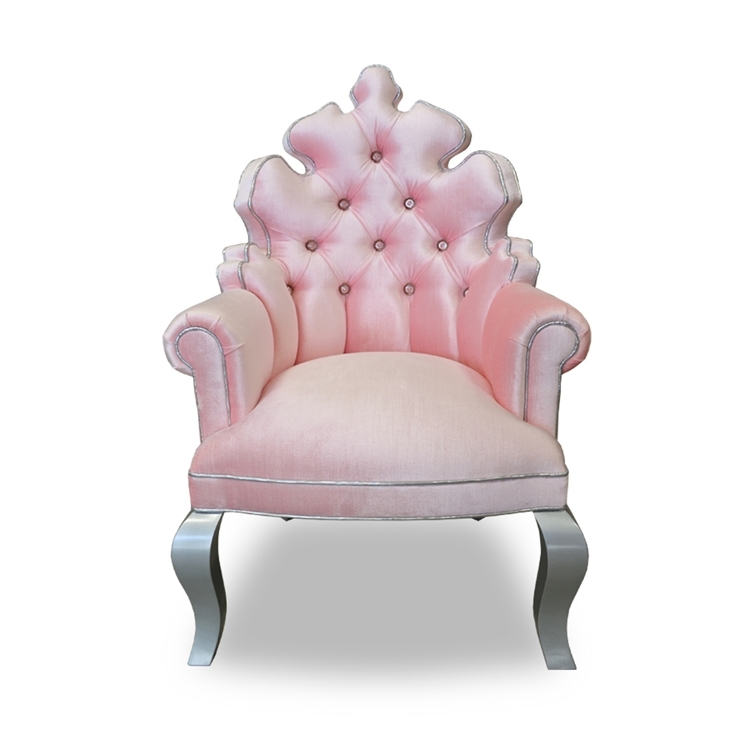 Customize any Haute House Home piece to your liking. Item sold as shown online. Note the measurements of the item, as this chair is smaller than the regular size Isabella Chair that is pictured in blue in the last photograph. The Jackie-O Buttons shown on the chair are no longer available, a different crystal button must be chosen. Boxed weight is approximately 45 lbs. Call 323.256.2800 for custom options.